In May, RAR/ASNI is gearing up for our 5th Massive Spayathon in as many years. This year in Craiova once again. 650+ animals will be spayed/neutered, and volunteers from around the globe will attend to help. We can reach this goal with your continued support! Our deepest and sincerest sympathies to the Braunsberger family, Karin and Richard, for their loss of the beloved Stuart, who crossed the Rainbow Bridge having fought a battle with cancer. Stuart will be remembered by many of our supporters, the sweet boy found on the train tracks near Timisoara, rescued and taken to Homeless Animals Hospital for treatment and care until a wonderful home was found for him in Florida. Rest in Peace darling Stuart, knowing how many lives you touched, and how you were so very loved. This has been another amazing month for Romania Animal Rescue and Animal Spay Neuter International! We have taken on new campaigns, been invited to Bulgaria to provide more spay/neuter and possibly establish an ongoing campaign there. We have met so many new friends! Volunteers have traveled to help at the spayathons from all over, giving hands-on support to our vital work, and seeing for themselves how the Dream Team is. Thank you wonderful people for giving of your time and funds to come to help! Our huge yearly spayathon is May 18-26 in Craiova, and more travelers will be coming to help out at the Homeless Animals Hospital where the event will take place. Upcoming campaigns include Miroslava Village, Vatra Dornei, Tecuci, Cluj, Buzau, Bacau, Moreni, Bucharest Villages, Calarasi county village campaign, and Carei. Animal Spay Neuter Intl. will travel to Bulgaria with the expectation to spay/neuter 150 in a new campaign for poor villages. Homeless Animals Hospital is treating animals every day. HAH provides vaccines to animals that would otherwise never have them. We are distributing education books to reach more communities. And the Veterinary Training Camp has received a sponsorship for one more Romanian vet to be trained. Thank you Elizabeth! Your donations make these programs possible. We could never accomplish anything without your help. I hope you will continue to support this vital work that is so essential to the well-being of animals and for those who care about them. There are so many people to thank, so much to be eternally grateful for. I would just like to say how extremely thankful I am to all of you, all of our supporters who donate and work so very hard to make life better for now millions of animals. Bless YOU! Thank you for making what was once a dream come true. Thank you Dream Team. I would like to share with you a glimpse of our daily work, both on the field and in the Homeless Animal Hospital. We have had numerous spay/neuter campaign trips this month. Thanks to our donors, close to a 1000 animals will never reproduce. This action is vital: To keep the unwanted puppies and dogs from being born into a world that will not care for them. A world where the heartless dog catchers patrol the streets to hunt the helpless abandoned dogs that have no fault for being born. At HAH we see daily cases of abused animals that are frightened and wounded and sometimes do not understand we want to treat their wounds and give them the treatment they need to recover and start a new life. I am proud to tell you that your Dream Team does not give up easily. Many times we are faced with this scenario: An injured dog, who was terrified of human contact having been abused previously, is brought to the clinic for treatment of an injury. Starting the next day he eats out of your hands and is relaxed while being bandaged, knowing he is safe now and forever. We are just the big brothers of the poor souls that come through our door and we treat them with the respect they deserve. Our biggest satisfaction is to see people bringing their animals to our spay project because they realize that there is no possibility to offer shelter food and attention to the never-ending litter of puppies. We are making progress in the field of the awareness level regarding spay and neuter. There is a big waiting list with places that have asked us to help them with free spay and neuter! Thank you for supporting us and I hope that you will continue support our work for the animals in need that deserve to fight a fair fight with their fate and this means to be spayed and neutered. Sending you all the best wishes for you and your families! Stay informed about our animal welfare campaigns in Romania by subscribing to Dr. Aurelian's blog: Homeless Animal Hospital, and Facebook page. Thank You for your support in helping us reach out to all of these cities, towns, and villages in Romania! ASNI/RAR funded 741 spay/neuter procedures in April in Ajud, Bacău, Bârlad, Bistrița, Moreni, Snagov, and Tecuci. 33,853 in Romania alone, 36,107 worldwide. Just by shopping at Amazon.com, you can donate to RAR: .5% of your purchases get donated to RAR when you shop at Amazon Smile and choose Romania Animal Rescue as your charity. I do not know if I'm the right person for this kind of text. I have only spent a relatively short time on the Craiova Spayathon because in the few days I visited Romania I had also to visit all rescuers I support. Nevertheless, I would like to tell you about why I think to buy a mobile clinic is an urgent need. It offers not only an incredible number of benefits for the animals but also for the team. So these are the things that I really realize as I saw them by myself, but I think you will understand. If you look at the images about the daily work of the dream team all looks so amazingly easy. Many happy people are waiting for the free treatment of their animals. A vet team that is well versed, yet lovingly cares about the furry patients. As a result, barely visible scars after castration, a hundred times animal suffering is prevented. What you may not realize is the work is extremely debilitating. The team (Volunteers) all are permanently on their feet. No time for a break because of waiting pet owners. Educational work is always ongoing. Also ordinary questions are answered, which clearly turns up by a pet owner when his/her pet faces an operation. And the phone constantly rings. What you may not realize is the expertise of each castration is routinely done. Sometimes the animals are not in good condition and also wounds have to be treated, claws cut, or sometimes dental treatment to be performed. At the same time everyone of the team always keeps an eye on the animals in the recovery area because complications may arise. The team takes responsibility for each animal in their care and they do it incredibly well. The team is doing all these things throughout the year. Therefore they are often far away from their families, their friends. Heat, cold, and wet cause difficult working conditions. In addition, working with animals requires (no matter how experienced you are) always an absolute attention and full concentration, but it is also more physically demanding as I can imagine at all. A mobile vet clinic will make the work for the team enormously easier and will prevent countless animals from suffering. I enclosed some old and new pictures that fit this text. They show the working conditions and make clear how complicated it sometimes is for the people of Romania to get veterinary assistance. Dear Reader, I would like to kindly ask for your help to make this wish of a mobile clinic come true. Join our event, spread the word and send a small donation if possible. Thank you, Nancy, because you had the courage to establish RAR approx 11 years ago, which has caused such an incredible amount of good deeds that I can hardly tell it in a few words. Thank you dream team for your incredible, professional work, your persistence, your compassion, your commitment. Thank you, dear volunteers from romania and from all around the world, for your completely unselfishly support, your time and manpower. Thank you, dear supporter, because only by your donations and spreading the postings this valuable work can continue. last but not least, thank you minya, tabitha & frank for all you do. As you can see, anyone of us can do something to make this world, our world, a better place. Thanks for your attention. Donate to our Mobile Clinic fundraiser through this Facebook campaign. Dr. Aurelian Stefan: The job of RAR is dedicated to the stray dogs, thus the neuterings. The special thing is that we think about the people who keep dogs but don’t want them to neuter, or they cannot neuter them because of a lack of money. We give them informations about neuterings and find solutions. Also for the dogs which live on factory yards, which are half owner-dogs and half strays. We specialize on people who cannot effort enough money to get a neutering for their dogs and on people who doesn't care about if their dogs are neutered or not. We find solutions for both kind of people to give neuterings to their dogs by carrying these projects out completely free. We found out that the demand on free neuterings in Romania is huge. Actually we do not have any problems with the dogs, rather than with the people. Dog-problems are human-problems. Dogs breed instinctively, but humans are able to avoid these unwanted breeds, if they want to, if they get informed and of course if they get help. Map Of Hope: And when hear about it! Dr. Aurelian Stefan: When they hear about that we are offering it for free. There are for example people who rescued 6, 7, 8 dogs from the street. These dogs are now in their yard or farm, but of course they do not have enough money to let them be neutered. And of course this isn’t a problem. I need to point out that the people simply do not have any idea how to neuter a dog. There is a common knowledge in the rural area of Romania that dogs are tools which are meant to be exploited; they are not man's best friend, but man's best tool of keeping thieves or wild animals far away from his household. Dogs do their jobs better if they're starved, chained, beaten, mistreated, ignored; these methods go as far as people can remember and they are known to build a guard dog's character. Usually, village dogs' diet consists of bread, polenta, raw corn or, if they are truly lucky, that days' leftovers. Sometimes, they are given a full, even though filthy, bowl of water; usually, in the winter time, people don't bother to water their dogs, with all the free snow going around. For a guard dog to be as efficient as possible, they have to live chained outside, far away from people, best in the back of the yard with a very tight chain. It is essential they build up their anger and frustration for the night time when they are released and given the privilege of guarding their territory. They are never given any attention during the day and the only words that can describe a village dog are "bad", "good", "stupid", "clever", "useless", "mean", which is considered being very good at what he does, being mean to thieves. In 2001, two friends from the San Francisco Bay area and I took a hiking trip in Romania. We immediately noticed the sad state of the dogs--unwanted animals abandoned to life on the streets, in forests, and fields. While nurturing some dogs in a park one day, a young lady approached me. She thought I was poisoning the dogs. She told me that the dogs were being killed and that she and her neighbors were hiding as many as possible from the authorities and could not take any more, so she was looking out for these dogs that were in the park. I told her I was an American, and I would go back to the USA and contact the international charities that I supported and ask them for help for Romanian animals. She replied "Everyone says they will help the Romanian dogs. They go home, they forget. You will go home, you'll forget." My reply, "I will not forget." Upon my return to the USA, I approached many international charities, and they all refused my request to help in Romania. After sending donations to a Romanian charity I met online in 2002, my husband and I began Romania Animal Rescue as a registered 501(c)(3) charity in the USA in 2003. Our mission is to "promote and establish animal welfare in the country of Romania." Read the full history of RAR on our website. Romania Animal Rescue/Animal Spay Neuter International is gearing up for our fifth massive spayathon. 2015 will be in Craiova once again, May 18-26 for 650 animals. $25 will provide spay/neuter for these animals, and prevent so much suffering. Please check out Facebook, for a marvelous fundraiser to help this campaign. Thank you to Mary and Bill, and to Bonnie for once again donating to this massive event as well! The following letter is the reason Animal Spay Neuter International needs to go to Bulgaria. Will you please help? Our team is located in Romania, which neighbors the country of Bulgaria to the south. It is a short drive for us and we can save so many lives with your help! 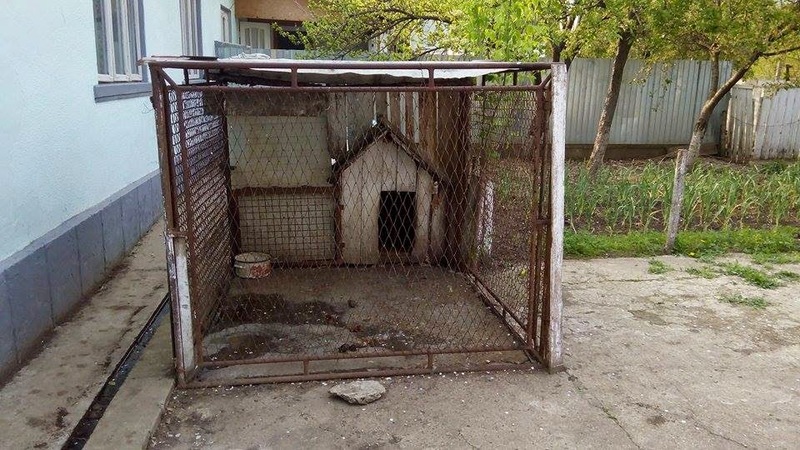 The plight of dogs, both owned and homeless, in rural Bulgaria, is less visible than it once was. These days, fewer are publicly beaten on any day of the year because of this; fewer are publicly hanged, and only a handful are axed to death or poisoned when they annoy the neighbours. The suffering, however, has not ended. Because there are so many puppies born, their lives have little value. Once they have stopped suckling from their mother, they are either 'thrown away' or handed out like sweets to children as young as three, or adults who want them only as live alarms for their yards. Many live chained 24/7 in their own filth, fed only bread. Many, if they become ill, or pregnant, are put in carts or cars and 'got rid of' on the outskirts of other villages, just passing the problem on. Urban areas have programs to reduce the dog population, but these schemes have yet to reach the villages, where, in some instances, farmyards bulge with in-breeding large dogs. Litters from these are often dumped in Roma ghetto areas, where people like owning dogs but have no means to feed or shelter them. I live in such an area. For over a year, I have been taking one dog per week from my local ghetto to be spayed or neutered. But the rate of births far outstrips the rate of operations, and I cant keep up. Only mass spays and neuters will change the situation in rural Bulgaria. ASNI is needed here! So far, ASNI has raised funds for 47 spays/neuters, and our goal is for a total of 150 for this campaign. We will be doing this campaign in the summer, and hope that we can make this a regular mission of Animal Spay Neuter International, to help in Bulgaria. Your donation of $25 will prevent needless abandonment and suffering. Please help us go to the villages in Bulgaria. It's the right time, and the right thing. Thank you! All snuggled and recovering from anesthesia following their spaying--no more unwanted kittens! This little sweetheart was suffering from a tumor and needed our emergency assistance. She was living in Caracal and brought to Craiova for treatment at the Homeless Animals Hospital, at no cost to her caretakers. We were able to provide books for education programs in Arad, Craiova, Bacau, Barlad, and Sighetu. The photos above are from Arad. Thanks to our amazing donors! Without you we could never do anything! Thanks to our fabulous fundraiser partners, Sue Roberts, Maz Foulger, Steph Blythe, Sue Blythe, Diane White, Secret Squirrel, Mishy Dunn, May Britt Seem, Ylva Gefvert for your donation matches, Annemiek Wienke, Baggys Legacy, Helga, Tabitha, Miriam, Frank, Rieni, Pat, Sir Tony and Nikki. Thank you to Dogs on Death Row, Cats on Death Row, Animal Care Austria and Carol Byers, Suzy Alexander, Mandy Easter, Richard Abbott, Margaret Gebhard, Jane Courtney, People4Pets, Strays United, Lesley Ford and Jane Sanderson, Mayhew International (for book printing), NESS, Kuono ry, Mary and Bill Morris, 4 StrayDogs, Bonnie Siddons for the earrings and endless support, Sandy Myatt for more earrings. All part of the Dream Team!